Upon researching this post, I was surprised to discover that most folks outside of the Jackson, MS, area likely haven’t heard of a tote-sum either. Seems that there was once a small chain of actual “Tote-sum” stores, whose name was so catchy that it quickly became synonymous with any local convenience store. Sure, maybe the restrooms at those chain places are a little less frightening. Perhaps the shelves are dusted a little more regularly. Maybe the dairy products are rotated a little more frequently, but I still have a soft spot for a good, old-fashioned tote-sum store. When I was growing up, my sister and I would walk up to Bernie’s where we could get chips, candy, and bottled Cokes just for signing our names on a slip of paper. It was a perilous journey (maybe a mile in the summer heat along a road without sidewalks. Uphill. Both ways.) but that just made the snacks that much more tasty. Eventually, the credit system was replaced by an actual cash register (or maybe Dad put the kibosh on our too-frequent charges), but still we’d save up quarters and waste countless afternoons playing Ms. Pac Man. About a year ago, one of those slick new gas/fast food joints popped up about a block from my childhood home. I haven’t been in there, so I can’t say what it’s like. But there aren’t any old men out front playing dominoes, so that’s probably a bad sign. I can still hear my Daddy saying, “Carry me down to the Tote-Sum so we can get some cold co-colas.” I think I spent a part of every afternoon in high school in Jackson stopping by the Tote Sum and getting an Icee. 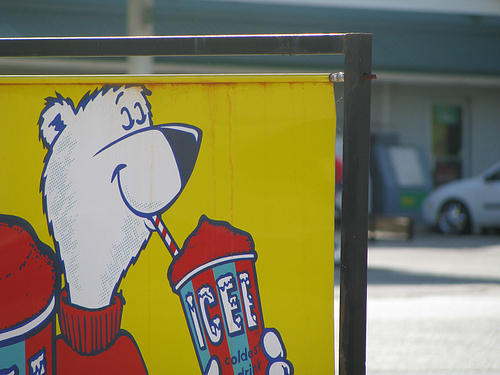 My favorite story: My stepsister stopped at the Tote Sum at Maywood Mart one hot summer day and left the car running so the air conditioning would keep the car cool, while she just ran it to get an Icee. When she came back, she saw her car driving off without her. Never did find it. marianne, thanks for your comment! my sister and i got many an after-school icee at an off-brand tote-sum. my favorite was coke mixed with whatever other flavor they had. it was the hip thing then. boy how times have changed! the story of your step-sister’s runaway car is hilarious! probably not to her, but still. my favorite story of that ilk was when one of my sister’s friends was driving by the local jitney jungle and noticed a makeshift carnival complete with funnel cake stand. (we refer to those carnivals as “the jitney state fair.”) she wheeled into the parking lot, threw the car in park (not exactly in a parking space), and ran over to the funnel cake stand without even bothering to close the door of her car. fortunately, nothing bad happened. unless you count her consumption of the funnel cake, which, for the record, i do not. My cousin and I would collect pop bottles to return for the deposit and spend the money on push-ups at the Tote-Sum up the street from Mammo’s house. I haven’t had a push-up in far too many years. I’ll have to check and see if they sell them at the 7-11. The ice didn’t come in plastic bags. It came after I crushed it in the ice crusher and loaded it in reinforced paper bags. I put up all returnable bottles (no throwaways) and swept, put up stock…I definitely earned my wages. I am mentioning Tote-Sum stores in my next novel. Thanks for sharing your memories, Paul. Love that they gave you the title “school boy” and that you managed to get such a hefty raise during your career there! My grandfather (Charlie Barry) started, owned and operated Tote-Sums along with my father (Stewart Barry), until he sold the chain in the 80s. In fact, my grandmother Charlotte came up with the name. I still call convenient stores Tote-Sums to this day. What a fixture these stores were in my childhood, and not just because they were our family’s business. During the summer, I’d play tennis at Parham Bridges everyday and take a break to go get an Icee at the Tote-Sum on Old Canton Rd. What a lovely memory. I must have been feeling sentimental this evening because I googled Tote-Sum and here I am. I’m glad to know other folks still remember this great southern artifact as well. If Charlie (“Mister” to me) Barry was your grandfather and Stewart was your father then Susan (our little league queen circa 1953) must be your aunt. Seems to me there was another younger boy. I saw Mr. Barry often as either he and/or Stewart were often in the store. Actually the Barry family lived only three or four blocks from my home at the time. Betsy, I sure appreciate your family’s contribution to my childhood. Your grandmother came up with an awesome name. Convenience stores will always be tote-sums to me, too! Tote-Sum was the greatest convenience store name in the history of the United States, as well as Canada. Like others in this thread, I was feeling homesick and Googled “Tote-Sum” to see what would turn up. Hearing from the granddaughter of the founder was icing on the cake. I was laughing last week with a friend (both of us from Jackson, but sitting in a hotel in downtown Houston, Texas) about the fact that we can’t stop calling convenience stores Tote-Sums. I think – on principle – I will never stop doing so. Icees, cheap candy (gum for a penny… are you KIDDING me? ), fried chicken — so glad I got to experience this. If anyone on this thread finds a picture of a Tote-Sum, PLEASE post it so I can show my children. I worked at the one off McDowell Rd. 65/66. Left in March 66 for the Marine Corps. It was fun there. I left for Parris Island in Qct. 64 —yes it was great fun! I’m from Jackson, Mississippi I do remember the Tote-Sum stores. A neighbor of my mom’s mentioned to a neighbor that grew up in South Carolina would she pick up a few items from the Tote-Sum store. She called me and I told her that’s like the corner store. She thought I was crazy too too. I told her that was a Mississippi thing and you had to live in Jackson during the late ’50s-70’s. I agree about living in Jackson. I had so many great memories, which is why I wrote A MISSISSIPPI WHISPER. Though fiction there is a lot of autobio in it—including the Tote Sum store #2 across from the Seale Lily. Jackson was a wonderful home. This is from memory and could be mangled, but i remember reading in the Clarion Ledger that there was an agreement of some kind about territory between 7-11 and Tote-Sum, 7-11 would stay away from Jackson if Tote-Sum didn’t expand beyond. There also was, i seem to remember, a conflict with 7-11 about the name since 7-11 was originally called Tot’m (with a Totem pole logo … like the tall vertical sign). I haven’t been to Jackson in almost 30 years, but i still call them Tote-Sums. And i’ve trained my friends. I remember climbing high enough in a tree in our yard that i could see the T-O-T of the Maywood sign! And then there was the night in about 1981 when a friend and i were bored so we we drove around town to EVERY Tote-Sum! Crazy.